The Ahmadiyya Muslim Association in the United Kingdom has donated two checks totaling £10,000.00 to assist the Liberian Government in the fight against the spread of the deadly EBOLA virus in Liberia. 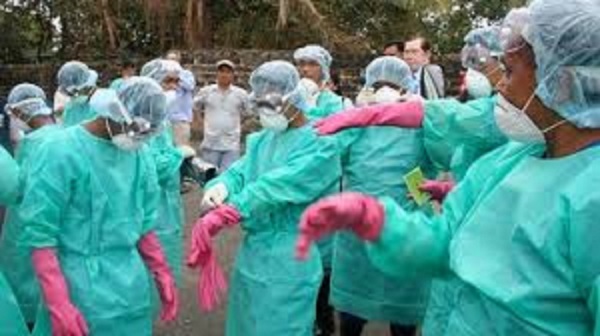 The money is intended to purchase essential medical supplies and protective gears for medical practitioners who have dedicated their time and efforts in the fight against the Ebola virus. Making the presentation at a special ceremony in London recently, the National President of the Ahmadiyya Muslim Association in the United Kingdom, Mr. Rafiq Hayat noted that the health situation in Liberia is of grave concern to his association especially at a time when the country is undertaking a massive rebuilding process. He said the amount is his association’s initial contribution and efforts will be made to galvanize more support from other Ahmadiyya communities. The checks were presented to Ambassador Rudolf von Ballmoos who subsequently turned them over to a representative of the Liberia Medical and Dental Association in the United Kingdom, Dr. Kokulo Waiwaiku and the President of the Union of Liberian Organizations in the United Kingdom, Mr. Prince Taylor. The associations have already commenced the purchase of intended medical supplies which will be airlifted to Liberia shortly. The Ahmadiyya Muslim Community currently operates a eleven bed room health center in Tubmanburg, Bomi County which was constructed in 2007 at the cost of $70,000.00 United States dollars to buttress government’s health care delivery system. The clinic was dedicated by Vice President Joseph N. Boakai.